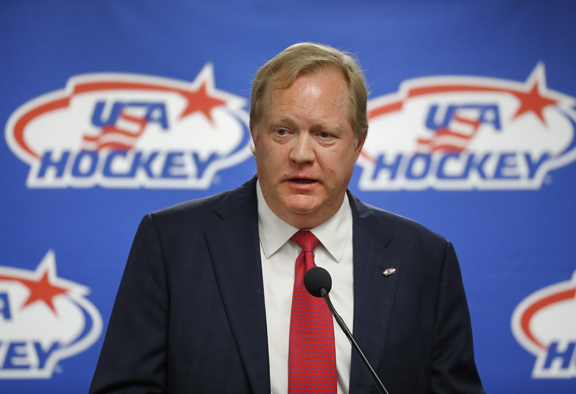 PLYMOUTH — Dozens of U.S.-born NHL players paid tribute to longtime USA Hockey executive Jim Johannson and raised funds for two of his favorite causes, his 2-year-old daughter and grassroots hockey. Auston Matthews and Patrick Kane were among the American stars and standouts who gathered for a charity game won by the Blue over the White 14-9 Sunday. Detroit Red Wings center Dylan Larkin led the push to get many players in the league to travel, at their expense, to play an exhibition game for 3,000-plus fans at USA Hockey Arena. The event honored Johannson, who died of heart disease at age 53 in January. He was serving as the U.S. men’s Olympic hockey team’s general manager when he died less than three weeks before the Pyeongchang Games.